KV Racing Technology has resigned Brazilian Mario Moraes just in time for the Sao Paulo, Brazil street race proceeding this weekend as the 2010 IZOD IndyCar season opener. Assigned to drive the #32 Banco Panamericano for the full 2010 schedule, a joyous Moraes commented in the team release saying "Being in the car to start the season is very important for me especially since the first race is in my hometown. KVRT is one of the best teams in the IZOD IndyCar Series and I am looking forward to working with everyone on the team again. Hopefully we can continue the success we enjoyed at the end of last season.". A student in world racing at a young age, Mario Moraes' not so distant youth consisted of experience in British F3 and FTR 1600. Spending two seasons in the IndyCar Series driving first for Dale Coyne Racing in 2008, Moraes found his competitive footing during the last part of the 2009 schedule with KV Racing Technologies. 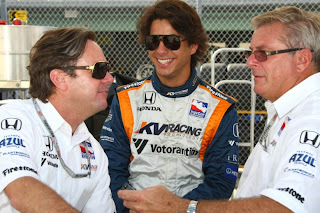 Garnering 3 top-5 finishes in the final 4 races of 2009, Mario Moraes prospects in the IZOD IndyCar Series appeared promising following the Homestead-Miami Speedway finale with KV Racing Technology rumoured to resign him for 2010. However, as months went by, KV Racing Technology added some confusion to Moraes situation by hiring EJ Viso and Takuma Sato last month. To the relief of Moraes, KV Racing Technology added a third car as team General Manager Mark Johnson explains. "Mario showed last season he can be very competitive and is in the process of becoming one of the top talents in the series." The 11th hour announcement regarding Mario Moraes is the 5th driver to be named to a full-time IndyCar ride through the past 11 days. With IZOD IndyCar practice and qualifying for the inaugural Indy 300 on the streets of Sao Paulo scheduled Saturday, expect the field for the open wheel driver/team lineup to be well-established for 2010.